Set in a perfect position high above Lake Windermere, the latest Laura Ashley-style hotel from Corus is already off to a great start! I was looking forward to our visit from the moment we got the invitation. I was keen to see exactly how the Laura Ashley design would work. I have to admit I did think it might be a bit twee and feminine. I couldn't have been more wrong. 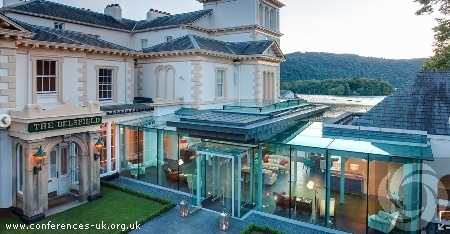 The Belsfield is one of the grandest Victorian Buildings on Lake Windermere. Built in 1845 as a large and beautiful home, the house was acquired by a steel magnate in 1869 before being converted to a hotel in 1892. Today, though, it's a great mix of Victorian and ultra-modern. Your first view of the interior is the stunning glass lobby, which bridges the two main buildings and is done up with sofas and rugs like a chic modern home. The colour and design throughout are cool and contemporary, with the hotel's decor regularly updated to match the latest collection from the famous store and design chain. The look continues through to the bedrooms (ours had a lovely view over Lake Windermere). After a fine northern welcome we got the full tour of the conference facilities - six stylish suites that offer daylight, air-conditioning, free high speed Wi-Fi and modern presentation equipment. The hotel also has its own grounds - ideal for team-building activities. The venue works with established companies to tailor activities to suit clients. Before we left we spent a few hours exploring Bowness and loved wandering round the independent shops and craft centres. We even took a ride on the lake (a lovely way to spend my birthday and while away the morning). I understand there's even a miniature 18-hole golf course and Beatrix Potter World not too far away. We missed the golf, but that just means there's something for us to see on our next visit! If you want a venue that offers delegates more than just a bedroom and food, this could be a perfect choice. It is readily accessible from anywhere in the UK, with fast train services from London and other major cities into Windermere and Oxenholme Stations, and good road links to the M6. And if you are looking for a personal venue, the management is building the Belsfield into one of the best places in the area to have a wedding!